Forest Hills Historic District is known for its picturesque, winding street plan, and for its groupings of fine Tudor Revival, Colonial Revival, and Bungalow housing. The quiet enclave of 1920s homes is distinguished by the brick piers flanking its major entrances and historic street lamps on the curbs. The wide, gently curving streets are very uncharacteristic of nearly all of Indy’s early 20th century developments. In 1922, landholder Benjamin Stevenson filed a plat with the small town of Broad Ripple, at a time when the Indianapolis city limits were still five blocks to the south of 56th Street. While town leaders in Broad Ripple considered the development, the City of Indianapolis annexed a vast tract including Broad Ripple. Stevenson’s addition became part of Indianapolis. The designer of the unique layout of gently curving streets in Forest Hills is unknown, but local landscape architect Lawrence Sheridan was probably the consultant. Unlike other 19th-century neighborhoods that had picturesque street plans, streets in Forest Hills were designed to be wide enough to carry 2-way auto traffic. The district had no alleys; each lot would have its own driveway. Forest Hills was also unique for its governance. Lot owners agreed not only to setbacks and development restrictions, but to theformation of a neighborhood association. Architecture in Forest Hills dates from 1922 to 1940. 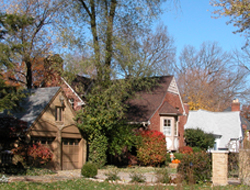 Picturesque Tudor Revival cottages are the most common type. Cape Cod houses, Bungalows, and other house forms were popular as well. Brick contractors showed their skills on these homes, selecting textures or unusual bonding patterns to enrich wall surfaces. Designer-contractors built most of the houses in the neighborhood. The district retains its original “Washington DC” acorn light standards, which were once common throughout Indianapolis. Forest Hills Historic District is located on the north side and includes College, Carrollton, Guilford, Winthrop, Wildwood Aves. and Forest Lane, 5600 to 5900 blocks. The neighborhood is bounded by the Monon Trail tracks, Kessler Blvd., College and Northview Aves. The district includes private homes, but visitors can drive, stroll, or bicycle ride on the quiet tree-lined streets. INDYGO bus line from downtown: #17 College Ave, disembark at Kessler at the northwest corner of the district.